Hi, does there anyone have the best settings for handbrake to shrink the video size down without loss of quality. Tired loads of others without Success. Now that I'm set up I want to start ripping my personal collection of DVDs. I am planning on using Handbrake unless otherwise told. What settings in Handbrake will yield the best results for my DVDs to be view on my TV? Forums are swarmed with countless posts from Handbrake users asking for the best Handbrake DVD settings, answers to the optimal settings for the free DVD ripper and video converter vary a lot and turn out to be of no value. But if you happen to come to this page, keep reading and find best handbrake settings for DVD ripping to iPad mini/Air. Take advantages of Handbrake alternative for Mac/Win - MacX DVD Ripper Pro to rip copy protected DVDs to MP4, MOV, AVI, etc with best settings for iPhone iPad Android. 36X faster speed and no quality loss. 1. Quality is generally classified into high, medium and low. Nobody want to watch a low-quality video on a big high-resolution screen. But it's truth the higher the output quality the longer time it'll take to rip a DVD or convert a video. If not so nitpick, medium quality can be a good choice. 2. The best HB settings shall stay within the bounds of mobile devices if you're encoding for your gadgets using Handbrake. That's to say, you shall be clear about the encoding specifications including resolution, frame rate, bit rate, etc beforehand especially when you are encoding a long movie or video. Take Apple devices for example, all generations of iPhone or iPad encode stereo audio at 160kbps. It's almost the case you choose a sampling rate of 48Khz while adjusting Handbrake settings for iPad or iPhone. For no device restrictions, 256kbps for stereo audio is recommended. But it shall be noted that most music you buy online is encoded at 192kbps. Doing some settings for Handbrake rip DVD can be a challenge. But this guide makes every setting you do in Handbrake DVD ripper open source as easy as possible. It's known to all that an ordinary DVD disc holds between 4.7 GB and 15.9 GB and DVD rips typically are between 5GB and 8GB in size. So it's deemed as indispensible to custom Handbrake settings with lowest size when using Handbrake to rip DVDs so as to ease the burden for the hard disk storage. Technically, it is ideal to convert DVD to MP4 file that has the knack for good quality preservation and small size retaining. Here are tips about how to the best settings for handbrake DVD rip. 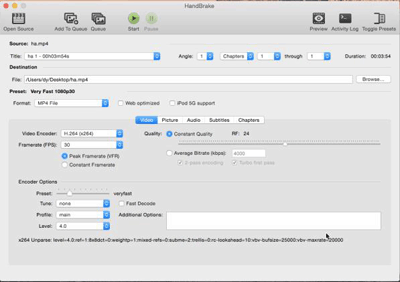 Best Handbrake Video Settings: Choose MP4 file container with a video codec of H.264. Check Avg Bite rate (kbps) and input 1400. MP4 is the best video setting for Handbrake when ripping and converting DVDs. Best Handbrake Audio Settings: If possible, choose AAC audio codec with mixdown of usually Dolby Pro Logic II. Make sample rate either Auto or 48, and bit rate 160. Try to always use higher settings because you won't regret it later. Best Handbrake Presets for Blu Ray DVD Rips: To build preset settings on Handbrake for blu ray DVD rip, you are suggested to pick MKV file as output format, for MKV can guarantee the superior video quality of blu ray, but also reduce file size of blu ray DVD from dozens of GB to several GB (50GB → 5GB). By courtesy of these recommended settings, Handbrake will produce about 1.5GB video from a 2-hour DVD movie. Sometimes you will need Handbrake to rip DVD or convert video to your iPad. The sad news is that there is no preset profiles for iPad in Handbrake to customize parameters. Still unaware of the perfect Handbrake parameter settings for iPad? Well, the following best handbrake settings guide for iPad will help you out, especially for beginners. Tips: Some DVD ripper or video converter is loaded with preset profiles for Apple devices including iPhone, iPad, Apple TV, iPod, iMovie, QuickTime, iTunes, etc. So if you know few simple tricks, use such Handbrake alternative to rip DVD or convert video to iPad directly without any hassle. 1. Customizing Handbrake DVD Settings for iPad Using Apple TV Preset: Apple TV supports higher resolution just as iPad, so you are recommended to use preset for Apple TV if you want to watch HD movies or videos on your new iPad. Here is the suggested Handbrake preset for iPad offering the best result. Load DVD or Video file into Handbrake and select Apple TV preset. The Apple TV preset works well if you'd like to rip a commercial new DVD movies; for HD video conversion, you are advised to raise the resolution to 1280 width in the Picture Settings of Handbrake. 2. Building Preset Settings on Handbrake for iPad Using iPhone & iPod touch Preset: In case you are eager to play your video on iPad or other Apple devices including iPhone, iPod, you can choose the iPhone & iPod touch preset in Handbrake as it offers a smaller size for the output file than Apple TV preset does. However, the image quality will be not as good as the preset for Apple TV preset does. This process is very much the same as the Apple TV preset. All you need is to change the resolution to 480p. Tips: The latest Handbrake v1.0.7 holds presets for iPad, iPhone, iPod and Apple TV. But these presets are targeted to order model. For the latest iPad Air 2, iPad Mini 4, iPhone Xs, etc, Handbrake presets are unavailable or they won't produce the best quality for your latest iOS devices. So you'd better search for a alternative to Handbrake or create custom Handbrake preset best suit for iPad. Handbrake settings are pretty much confusing and tricky for many users, not to mention the best settings in Handbrake 1.0.7. Worse still, even though you go through a lot of time to do the settings, there are still existing a spate of Handbrake errors like No Valid Source Found, Audio/Video out of sync error, Handbrake MKV converting problem, Handbrake 99-title Disney DVD rip error, no title found issue, DVD error reading and so on. So a once-and-for-all solution to tackle these issues is to find a Handbrake alternative for Mac/Win that not only save your time in finding the best Handbrake settings for DVD rips and your devices, but also rip any encrypted DVD to your devices without any error. 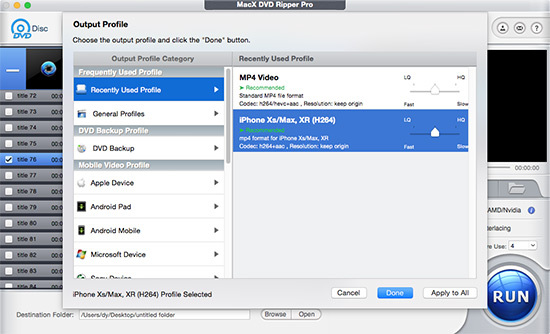 Fortunately, MacX DVD Ripper Pro undertakes the DVD ripping task, capable of copying and ripping the latest copy protected DVDs to MP4, MOV, FLV, AVI, WMV, MKV, etc with lossless quality. This DVD ripper for Mac also furnishes with preset profiles for the latest devices. That's to say, you don't have to do the settings for iPad or DVD rips like Handbrake but just directly import DVD to iPhone Xs/Xs Max/XR, iPhone X/8/7/Plus, iPad Air 2/mini 4, Android, etc without knowing the preset settings for your devices. For your reference: After ripping DVD to AVI, MOV, FLV, MP4, WMV, MKV, etc, you can apply MacX MediaTrans to transfer the converted movie/video to iPhone iPad iPod for enjoying on the move. And this iOS mobile transfer also is able to transfer photos from iPhone to Mac, copy music/voice & ringtone from iPhone to Mac or vice versa, manage ebooks on iOS devices, etc.